We're starting a new project here, our first 'mini' truck. Our goal is to build a capable autocross/road coarse truck without loosing all of the street manors, and do it on a budget. We bought this 94 shorty, with no motor/trans for $300 bucks. We've got $220 back from parts sold off. First we gutted it, down to the bare shell. Then we started with a plan of action. 6.0 LS, camaro 5 speed, low, fat, big tires all around. Our first thought was urathane or solid cab mounts. Wait, do we need cab mounts? We unbolted the cab and set it down, it almost clears. Some parts of the floor hit the frame. Hmm, we carefully notched the floor and set it down. This is the first drop. 1 1/2" down. We carefully aligned the cab to the chassis and bolted the corners down, then welded the floor to the chassis. Yes, this may increase the road noise, it will also strengthen the truck as a whole. We're going for it. Getting the bed down was a little more work. For the front mount, we cut the top off of it and fabbed a new top plate to be welded on. The second mount is welded to the side of the frame, so we cut it off and re-positioned it, then welded it back on. For the third mount we notched the bed crossmember and put the nut plate back in place. And in the back, we notched the back of the frame down and welded a new tab on. We also moved the bed forward to fit the cab better. Next we need to fix the bed floor. We fit a peice of 18ga. to cover the hole. It has four holes in it that line up with the cage plate. next the cage plate goes on. Our goal is to be able to unbolt and remove the rear cage bars, and the bed, just in case we need to late on. One reason we moved the bed forward was to close the gap for the cage pass through. We set the bed with a 1/2" gap between thefront bed panel and the back cab panel. The cage mount plates fit on either side, with a 1/2" thick aluminum plate in between the two panels. When it's bolted up tight it's rock solid. The frames on these trucks flex and twist alot, so hope you dont get a distortion until the point the doors wont close right. But.. interesting build, looking forward to seeing the build! That is a concern, and we are going to stiffen it up a bit. As part of the plan to stiffen the chassis up a bit, and add some driver safety, we are building in a 6 point cage. The rear section is made to be a bolt in so we can take the bed off later. We are using 1 3/4" x 120 wall DOM for the main bars. The X-brace is 1 1/4" 120. For the inside of the cab we are doing a simple main hoop and door bar. We will be adding a bolt in diagonal bar after the seats are fitted. We braced the floor with 1/8" plate, tied to the cab mounts and chassis, this gives us a strong location to mount the cage to. As we said, this is for chassis strength and safety. It may seem like too much for some, but if you've ever been down the long straight at ButtonWillow, (raceway) you would want one. Nice work! Are you guys going to cut the front frame horns and lower then down to match how much you lowered the body? That would bring the body and bumper down to match while allowing the front sheet metal to float like factory on the bushing. how will cali smog affect it? Cool Stuff, I'll have to watch this one. I always like Rob's stuff. Well thats the crappy part. - or one of them. We are swapping in a 6.0 and 5 speed, and we have to be REALLY carefull. The internals will be mostly stock, with a little cam. Stock externals with hugh flow cats. We can get it done, but the new tag (for smog requirements) will be based on the year of the motor. That means stock harness and ECU. It's a headache for sure, but we gotta do it. looks like its going to be awesome. how low will you be when your done. 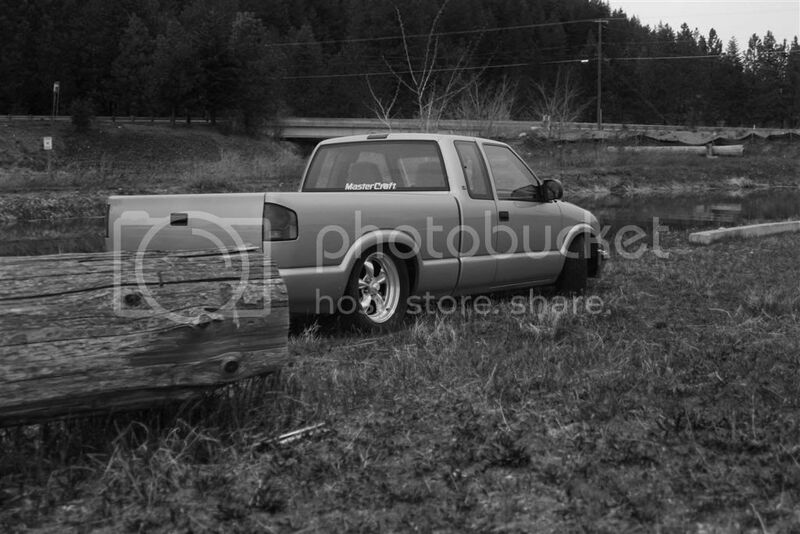 this is my old s10 that qa1 coil overs drop spindles and dearched leafs with a 2 inch block. then alignment shims for the pinion and carrier. Set the motor in yesterday. Hmm, no go on the truck intake. Our body is almost 2" lower to the chassis, I guess that does it. car intake it is. We also decided to set the motor back a bit, Less than it looks like, about a 2" setback in the firewall. We aren't using the A/C, and we'll be putting in a universal heat/defrosester inside. More fitting up later today. Last edited by robnolimit; 01-24-2013 at 12:27 PM. I like the direction this build is going. 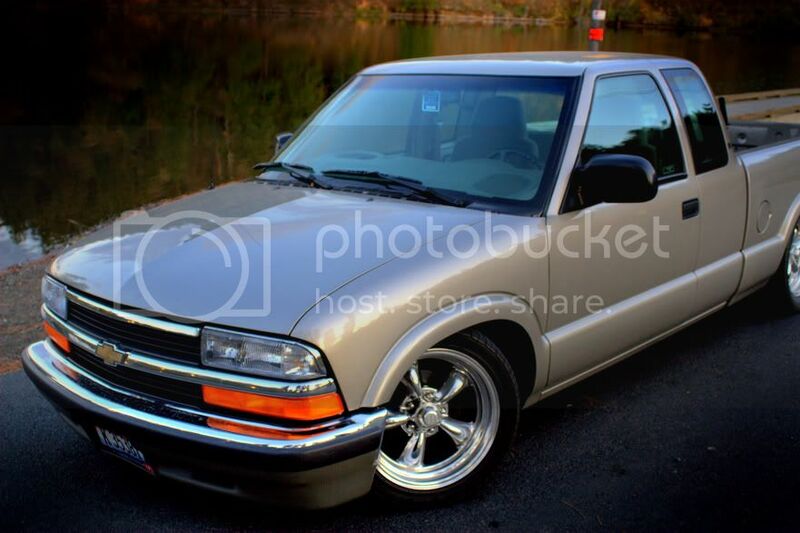 I have a '96 s10 ss that I've threw some poly at, it handles pretty well with the zq8 suspension package. Have you checked out www.protourings10.com? This oughta be fun. I gotta see this. It'll be fun at Adams, that's for sure! Here's today's project. Take the bed sides off. We started by unbolting and moving the bed back, and then drilling out all of the spot welds. This takes a while. We start with a 1/8" hole all the way through, then a 11/32" bit 1/2 way through. Last step, the inner fender underside needs to be cut loose.